Pastor Chuck Carlson passed into his eternal home on June 12, 2018. Formulating parting words about my Chuck Carlson, my best friend, partner, and lover of 47 years is very difficult. Many of you have already beautifully described the kind of person he was on Facebook and through private messages. Thank you for these kind and precious words that are a comfort to his family. I’m going to try to share what was on his heart during the 10 day window of life and awareness he had the beginning of June. He had been suffering a failing heart and an infection that shut down his kidneys. He was “out of it,” in and out of lucidity with waves of pain and agitation. One afternoon, Harry, his best friend of over 65 years, and wife Bee, joined me for a visit. We shared iPhone pictures of their family vacation, etc. all with Chuck’s eyes closed. Suddenly, he opened them up really big and was AWAKE! He was so happy to see us. He started teasing Harry, laughing and cracking jokes. He felt great! He had no pain, yet no strength. He was told how serious his condition was and that he was on life support. He was filled with the Spirit, sharing God’s word and joy with anyone who came by. He talked and talked about so many ideas and what he wanted to tell his congregation. He knew he has a short time left and was filling every minute with what was important to him – his purpose for living. He and I shared scriptures with each other and prayed together. He prayed for each person that came to see him. I think the best way to describe what he wanted to say is by using the words of Paul below. Please take a moment to read these words as if Chuck himself is saying them to you. He loved you so! 12-13 What I’m getting at, friends, is that you should simply keep on doing what you’ve done from the beginning. When I was living among you, you lived in responsive obedience. Now that I’m separated from you, keep it up. Better yet, redouble your efforts. Be energetic in your life of salvation, reverent and sensitive before God. That energy is God’s energy, an energy deep within you, God himself willing and working at what will give him the most pleasure. 14-16 Do everything readily and cheerfully—no bickering, no second-guessing allowed! Go out into the world uncorrupted, a breath of fresh air in this squalid and polluted society. Provide people with a glimpse of good living and of the living God. Carry the light-giving Message into the night so I’ll have good cause to be proud of you on the day that Christ returns. You’ll be living proof that I didn’t go to all this work for nothing. I’m still figuring out what I will do now. I know I’ll be moving out of the Seal Beach apartment in a month or two. I will probably be traveling and living with my kids and grandkids in Morgan Hill, Idaho and North Carolina. Put Saturday, August 4, 10:00 AM on your calendars. We are planning a special Celebration of Life for Chuck at Seal Beach (on the sand, north of the pier) followed by a paddle out led by M&M Surfing School. Wetsuits and boards will be available for you to join in, so bring your bathing suits and/or chairs/blankets/towels. We’ll have a reception afterwards – TBD. I am so grateful for the outpouring of love and prayers. They’ve held me up like a life raft in a storm. I feel your love, and I love you back. 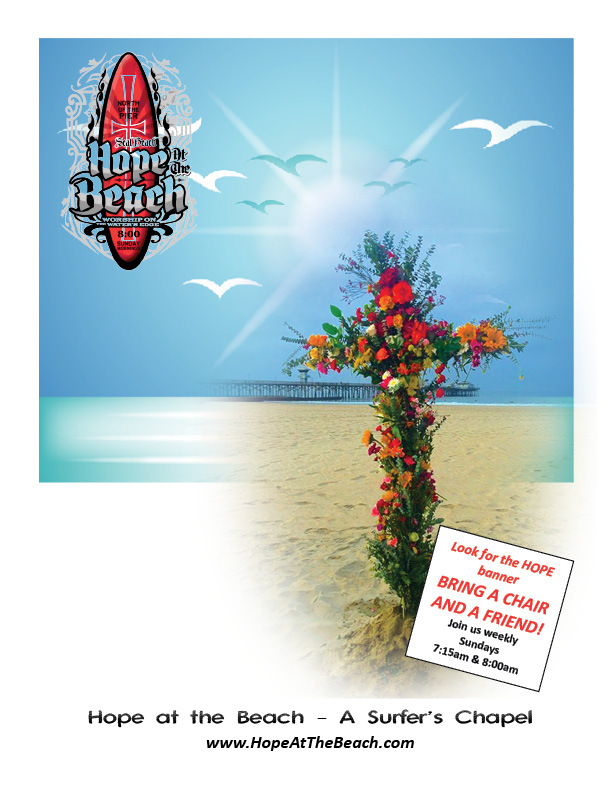 Thank you for affirming our lives along with the ministry of Hope at the Beach. God’s word never goes void, so keep on spreading the Good News to all you encounter. You are loved – unconditionally and accepted into the kingdom as children of God. Jesus made it so!